Tracing back the earliest stories takes one to the 1930s but I find the field is more extensive in the UK than the US until the 1980s. In both countries the types of schools depicted are often very exclusive private ones—in the UK the boys prep schools from age 8, which prepare them for public schools between the ages of 13 and 18. State (centrally funded) schools in the UK take local children of from 5 to 18 with a split between primary and secondary, usually at age 11. In the USA there are also fee-paying schools available; children move to secondary school at 6th grade and on to high school for 9th or 10th to 12th grades. Mysteries in both countries concentrate on adolescent pupils, presumably for their hormonal unpredictability; often the schools are boarding schools with closed societies where troubles can fester. James Hilton (famous for Goodbye Mr Chips) wrote Murder at School (US title Was It Murder?) in 1931, with an Old Boy investigating deaths of two boys at his public school. The victims are not developed as characters at all and the interaction in the story is between staff. Books about schools seem to divide into two categories—those where the effect of the death of a pupil or member of staff causes parents to withdraw their children, thus threatening the continuation of the establishment or those where, amazingly, such deaths have no apparent effect on the parents. This book is in the second category. Gladys Mitchell has several books set in schools (she was a teacher) and Tom Brown’s Body (1949) is a public school setting in which staff and pupils are well developed characters. Nicholas Blake has A Question of Proof (1935) which, I suspect, uses the actual prep school teaching experience of Blake (pseudonym of C. S. Lewis), since the interaction of the teachers rings true and there is good description of lessons. The victim is a boy but, in Golden Age tradition, he is unattractive and hardly seen in the book before his demise. In Death Goes to School (1936) Q Patrick also prefers not to develop the characters of the two schoolboy victims and deals mainly with the staff. Josephine Bell’s Death at Half Term (1939) is notable for the good portrayal of boys and their conversations. Hindsight by Peter Dickinson is written and partly set in 1983 but the hero remembers the summer of 1940 at a prep school evacuated to Devon. It is a superb evocation of the 1940s world seen through childish eyes but told by an adult who can interpret what he experienced in the light of adult knowledge. The Importunate Schoolmaster who, on the plea that other institutions besides the public schools could do with a few murders, bludgeoned me into writing it. really clearly using teacher characters. Murder in the Coalhole (US: Written in the Dust) was the 1940 offering by Miles Burton, the first to concern an elementary school. He quotes the Council instructions about the running of the school by its headmistress on a number of occasions—thus enlightening his readers. No pupils appear; events centre around the head and the Board members, particularly the vicar and the school correspondent (a school manager). For the US I found only the Stuart Palmer series about teacher Hildegard Withers beginning with Murder on the Blackboard (1932) and not really having activity in the classroom, and Helen McCloy’s Through a Glass Darkly (1949), which has the first part in a girls boarding school as a clever ghost story is developed. The 1950s have only a few books in the UK and I couldn’t find any for the US. We return to a public school with Norman Longmate’s A Head for Death (1958) featuring an unpopular headmaster whose wife, an ex-teacher, matron and a boy with a yen for the attractive au pair are potential murderers. In Murder Out of School (1951) Miles Burton, unusually, refers to current events as villainous Communist spies are smuggled into England via a prep school. The most interesting book of the 1950s is Agatha Christie’s Cat among the Pigeons (1959), when murders of staff and kidnapping threats in the exclusive girls school lead parents to remove their children as you would expect in reality! The 1960s was a period of turmoil in British education not reflected in the books available. Elizabeth Lemarchand, a retired headmistress, has a traditional girls boarding school in Death of an Old Girl (1967) and a prep school in The Affacombe Affair (1968). In a very early John le Carré, A Murder of Quality (1962), George Smiley investigates a public school death. Three writers give excellent pictures of different institutions: Firstly W. J. Burley (later to write the Wycliffe series) has A Taste of Power (1967) an excellent evocation of a coed grammar school—the staffroom exchanges ring really true and the sixth form pupils interact very convincingly. Janet Caird’s Murder Scholastic (1967) presents a Scottish secondary school which is a centre of its community and, again, most convincing. Another Scottish setting is a Glasgow High school in D. Devine’s His Own Appointed Day (1965)—a boy whose adoptive sister teaches at that school disappears. In Teacher’s Blood (1964), Ivan Ross spins a melodramatic tale involving a teacher at Mark Hopkins High School in the US and showing good insights into teaching. Sniper by Hugh Pentecost (1966) uses a US boarding prep school as its setting but that is all—no involvement of boys and no response by parents to the murder of the headmaster. Into the 1970s and 80s with traditional schools—Antonia Fraser offers a slight change of venue with a Catholic boarding school run by nuns in Quiet as a Nun (1977). Snares of the Enemy, by Pauline King (1985), turns to a monastic boarding school for boys where matron has been killed. Michael Gilbert has a chilling tale of the search for a murderer of boys gradually settling on a prep school in Night of the Twelfth (1976). B. Gill’s equally chilling Death Drop (1979) has a father finding out what happened to cause his son’s death at boarding school. At Coriston College, a mixed boarding school in Oxfordshire, the headmaster faces allegations about his behaviour with a girl hitchhiker, and the destruction of his career in John Penn’s Mortal Term (1984). Robert Barnard, with his usual skill, chronicles the extinction of Burleigh School for boys—the murder of a boy precipitates the final stage in the drama as the staff struggle for survival in Little Victims (US: School for Murder) published in 1983. An early Susannah Stacey (also known as Staynes and Storey) is A Knife at the Opera (1988), which features a murder of a teacher. The school is a girls day secondary school and its atmosphere is most authentic in the conversations and behaviour of pupils and staff. In the US, Amanda Cross set The Theban Mysteries (1971) at a fashionable fee-paying New York girls school where Kate Fansler investigates the mystery which threatens to destroy the school with scandal. Joan Hess’s Dear Miss Demeanor (1987) gives Claire Malloy the temporary job of teaching journalism at Farberville High School when the headmaster is poisoned. The US series that begins with Caught Dead in Philadelphia (1987) by Gillian Roberts has Philly Prep teacher Amanda Pepper investigating events that occur during her various teaching experiences. In the last decade and a half the numbers of crime books published that are set in secondary schools are roughly equal in the UK and the US. The private fee-paying schools remain popular choices for writers—three good UK examples are given below. Elizabeth George’s Schooled in Murder (1990) shows a public school as an enclosed society with something evil at its heart, which has resulted in the death of a brilliant boy. In 1993, Robyn Sheffield wrote A Killing Term, set in Trelawne private boys school, run by its headmaster like a feudal estate. A worthy addition to the genre of exclusive fee-paying academies was published in 2001 by Alison Taylor with Child’s Play. Here a body of a pupil starts a nightmare scenario of further accidents and deaths in a stifling and cruel girls school—where survival of the fittest has led to appalling bullying. There are also examples in the period of ordinary schools—Pauline Bell (an experienced teacher) has two books set in different high schools; in the Dead Do Not Praise (1990), eight of the staff and pupils of a comprehensive of 850 pupils are the suspects for the death of the headmistress; and in Downhill to Death (1994) the drama teacher at Holmbrooke High School fails to arrive at a rehearsal because she has been killed. The death of a 15-year-old pupil in Jill McGown’s A Shred of Evidence (1995) turns the spotlight on her school—Oakland School—a mixed secondary. In Governing Body (1997), by Anne Wilson, the head teacher is found holding a knife over the dead body of the Chair of the Governors. Patricia Hall brings the topic up-to-date with The Coldness of Killers (1992) when a Pakistani ex-pupil of Sutton Park Comprehensive in Yorkshire is found murdered in the school showers and racial tensions come into the open. M.J. Trow has a series about Peter Maxwell, a history teacher, who becomes embroiled in serious matters while teaching at Leighford High but finds the knives-out politics of school life stand him in good stead. 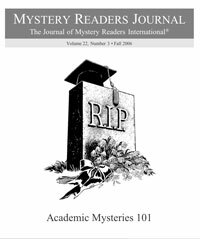 An issue that produces several mysteries for the US is that of reunions—The Thousand Year Stare by R. Kantner (1991), Murder at the Class Reunion by Triss Stein (1993), Jean Hager’s Dead and Buried (1995), and Kathleen Taylor’s The Hotel South Dakota (1997). The opportunities for current rivalries combining with memories of 25 years before are obvious. Private schools provide the suffocating atmosphere many writers appreciate; examples include The Main Line is Murder by Donna Huston Murray (1995), when the private school Bryn Derwyn Academy is threatened with destruction as frightened parents pull their children out of school when a corpse is found. Another establishment threatened by events is in Kate Flora’s An Educated Death (1999)—Bucksport private girls school is engulfed in scandal after the death of a pupil. In Shadow of Death by N. Kilpatrick (1995), Woodhaven private academy is the Christian school affected by a pupil’s death. Other schools are also affected by murders of pupils—Marion Rosen’s Death by Education (1993) has Greta Gallagher, teacher and counselor finding a girl’s body in the English office of McCormick High in L.A. In Murder of a Sleeping Beauty by Denise Swanson (2002), at Scumble River High the school’s psychologist finds the body of Lorelei Ingels, cheerleader, beauty pageant queen and star of the school play on stage. wealthy families; however, the local high school also provides the adolescents and interacts with locals including pupils’s relatives. I have tried to find books where the school is central and where pupils are involved as characters but there are many books, particularly earlier ones, where the staff provide the focus. Dr Jennifer Palmer is a retired history teacher enjoying the opportunity to read all those books waiting on her shelves and to write about her great interest in detective fiction of various sorts. The Lake District is the English countryside’s most popular tourist destination and it’s also a haven for British people who want to escape urban pressures and live the dream in an idyllic rural location. In The Coffin Trail (2004), Daniel Kind is persuaded by his girlfriend Miranda to abandon his life in academe and downshift to the Lakes—a move which is the starting point for my series of mysteries set in the Lake District. Daniel is a historian, who studied and taught at Oxford—itself a wonderful city, where I spent three very happy years as a student—but although he has achieved success and a measure of fame with books and television shows, events in his personal life, coupled with weariness at academic in-fighting, prompt him to seek a complete change. Like the late American historian and detective fiction aficionado, Robin Winks, Daniel sees similarities between the work of a historian and the investigations of a detective. His interest in detective work is fuelled by the fact that his late father, Ben, who left the family after falling in love with another woman, was a professional police officer. And when Ben moved out of the family home, he too relocated to the Lakes. Hannah Scarlett is a Detective Chief Inspector in the Cumbria Constabulary who has recently been put in charge of a newly formed “cold case” team. Early in her career, her mentor was Ben Kind and soon her path crosses with Daniel’s. Daniel wants to find out more about his father, and is also fascinated by Hannah’s investigative work. Her caseload requires her to dig into the past and he wants to persuade her that the disciplines of the academic historian may help her to solve murders. She isn’t easily convinced, but nevertheless a bond forms between them. The Coffin Trail takes its title from an ancient feature of rural England, common in the Lake District. In bygone years, when a person died in a valley that lacked a graveyard, the body would be strapped on the back of a packhorse and led over the fells (as the hills of the Lakes are called) to a valley where the deceased could be laid to rest in consecrated ground. A coffin trail leading from the valley where Daniel and Miranda buy a cottage, plays a part in the unravelling of the mystery of a woman’s death on the Sacrifice Stone, an ancient boulder that looms against the skyline above Brackdale. The second book in the series, The Cipher Garden (2005), sees Daniel trying to fathom the secret behind the strange layout of the grounds of Tarn Cottage, where he and Miranda live. Meanwhile, Hannah is prompted by an anonymous letter to revive an investigation into the unsolved murder of a notorious womaniser in a small community in the area made famous by Beatrix Potter. Again, Daniel contributes a historian’s perspective to the case and helps Hannah to uncover a shocking truth. The latest Lake District Mystery, due to be published in the UK and USA in February 2007, is The Arsenic Labyrinth. One of the fascinations for Daniel (and for me) of the Lakes is that it is an area steeped in myth and legend—and in fact, a fictitious museum dedicated to local legends features in the book. In this story, his researches into the final years of John Ruskin, spent at Coniston, counterpoint Hannah’s efforts to explain the mystery of a woman who went missing inexplicably ten years earlier. When Daniel tracks down a set of documents bought by a local historical society at auction, he comes across clues that help solve a murder mystery dating back to the years immediately after the Second World War—although Hannah still has much work of her own to do in order to trace a contemporary killer. The concept of historian as detective appeals to me and I like to think it offers tremendous scope for future books. The tensions between Daniel’s academic approach to mysteries and Hannah’s more pragmatic methods reflect the tensions between them as they become increasingly aware of a strong mutual attraction—an attraction which troubles them greatly, as they are both involved with other people. As the pair become closer, Daniel comes to realise that, for all his intellectual gifts, a cerebral approach does not help to solve every mystery—just as it does not help to solve every challenge in personal relationships. Martin Edwards is the author of eleven crime novels and many short stories; his work has been nominated for two CWA Daggers. The Coffin Trail, The Cipher Garden and The Arsenic Labyrinth are all published in the UK by Allison & Busby and in the USA by Poisoned Pen Press. The Coffin Trail was short-listed for the Theakston prize for best British crime novel of 2006. Some of this group had devoted their lives to teaching for the joy of it; some were putting in their time, due to lack of imagination or energy, until they could reasonably cash in their TIAA-CREFS. Besides the rich cast of characters an academic setting offers and the petty and not-so-petty intrigues that inevitably occur in such closed environments, I also chose it for The Body in the Bonfire and my juvenile series, Christie & Company, because I could eliminate parental interference. This was especially important in the Christies—”You want to go where and do what!” has to be absent. assembles eight of their classmates on her remote island off the coast of New England to find out once and for all. None of the women know the others have been invited and none of them have stayed in touch. Faith is, of course, the caterer. Four of the book’s chapters take place in the past during the alumnae’s four years of college. These were great fun to write, coinciding closely with my undergraduate years at a similar institution. Revisiting rules, customs, and even the food cooked in each dorm’s kitchen—no food services—it seemed an era with closer ties to the 19th than 20th century. A faculty member plays a key role in Ivy, but the book is essentially about the relationships among the women, with “Prin”—murdered and not a suicide—the individual around whom all the action revolves, both when she’s alive and when she’s dead. Our school years, however long or short, leave an indelible mark. The sadistic teacher, the bully, the sleepless nights before exams, papers due remain with us in dreams and fleeting, waking thoughts. There’s plenty of poison in the ivy. Katherine Hall Page is the author of the award winning Faith Fairchild series. The Body in the Ivy (Wm. Morrow) is the 15th and most recent book. She was the Guest of Honor at Malice Domestic 2006.